is an American provider of enterprise localization services in 170+ languages worldwide. It has staff in 90+ cities, 20 production centers on six continents. It works with more than 3,000 companies across all the major industries. WPML Multilingual CMS – the core plugin. 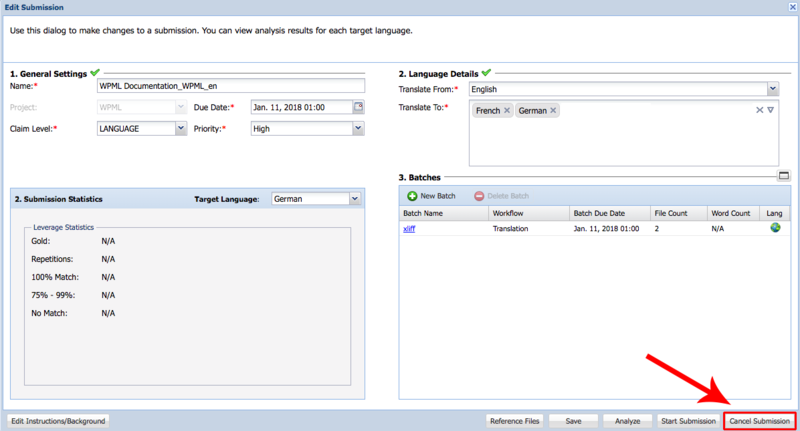 WPML Translation Management – this plugin will allow you to connect to Translations.com. WPML String Translation – this plugin will allow you to translate interface strings. If you do not have a wpml.org account yet, you can create a new one by simply choosing between our WPML Multilingual CMS and Multilingual CMS Lifetime plans. As soon as you get access to your wpml.org account, check our detailed step-by-step guide on how to download and install WPML. Please remember to register your site to receive automatic updates and gain access to Translations.com’s services. If you need any help with the WPML plugin configuration, you can go through our getting started guide or just ask a question on the support forum. Once all the required plugins have been installed and activated, all you need to make sure you have on hand for connecting WPML to the translation service is your Translations.com Project Director URL, username, password and project code. If you do not have a registered Translations.com account yet, you will need to contact the Translations.com to create one. Click on the “Contact us” link located at the top right area of the site. Then, you simply fill in and submit the form you see on the “Contact us” page. A Translations.com representative will get in contact with you to set up the appropriate account. When the account is ready, you will receive a “GlobalLink Technology Configuration” PDF document with your account details. Your Project Director URL, username, password, and project code can be found in the PDF document. Once you have copied the fields, we are ready to activate and authenticate Translations.com from your WordPress administrator. Login to your WordPress website, visit the WPML->Translation Management administration screen, and switch to the Translation Services tab. Scroll down to Available Translation Services and click “Activate” to activate Translations.com. Once the service is active, click the Authenticate button to authenticate the service. This is where you will need your Project Director URL, username, password, and project code obtained in the previous steps. A pop-up window will appear in which you can enter your Translations.com Project Director URL, username, password, and project code. Enter the values and click the Submit button. Congratulations! 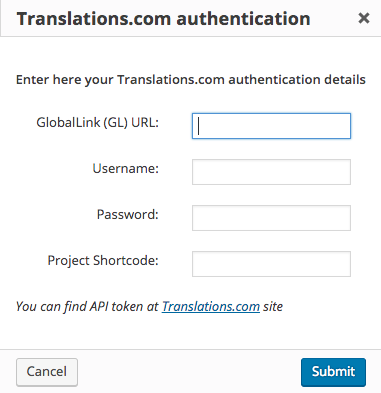 Your Translations.com account is now connected to your WordPress instance. To send documents for translation, open the Translation Dashboard page (WPML->Translation Management) and select the posts and pages you want to have translated using the checkboxes in the first column. After that, scroll down to the list of languages, select the target languages, and click the Add selected content to translation basket button. After the page reloads, a new tab appears at the top of the page, called Translation Basket. On this tab you will find a list of all items (posts, pages, and strings) that you have added to the basket, as well as the languages these items are to be translated into. Here you can verify the content you wish to translate, remove posts and pages mistakenly added and change the “Batch name” – “Batch name” will be visible on the Translation Jobs tab and will help you to find projects. When you are ready, simply click Send all items for translation to send everything to Translations.com. When the translation basket’s contents have been successfully sent to Translations.com you will see a confirmation message such as the one shown below. 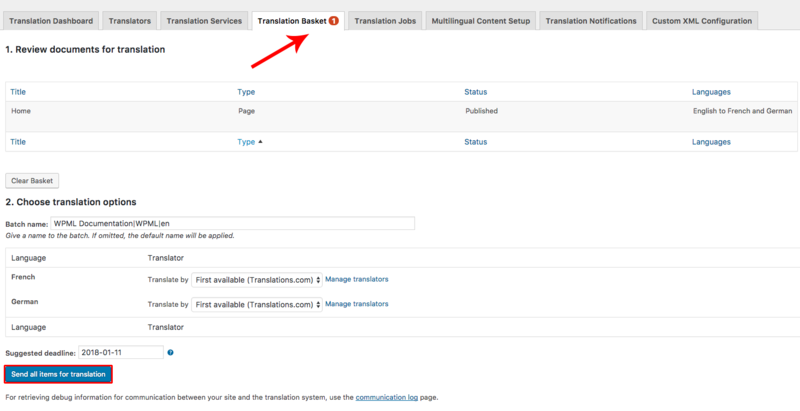 Follow the “Translation Jobs” link you are given in the confirmation message or click on the Translation Jobs tab at the top of the WordPress administration screen. From the next administration screen, you can click on the Batch name to be redirected to Translations.com’s GlobalLink director dashboard. From here you can click on the Start Submission icon to have translators begin translating. If you would like to send a note to the translator or set a deadline for the translation job, click on the Edit Submission icon. Editing a submission will open a pop-up dialog where you can edit details such as a job’s due date, add instructions to the translator, etc. As soon as a translation job is ready in Translations.com it is also ready to be delivered to your website. Check for completed jobs by visiting WPML -> Translation Management and clicking on Translation Jobs. Locate the batch you want to check and click on the Synchronize status button. The “Translation Service will deliver translations automatically using XML-RPC” option means that as soon as a translation is ready, it will be delivered to your website automatically. 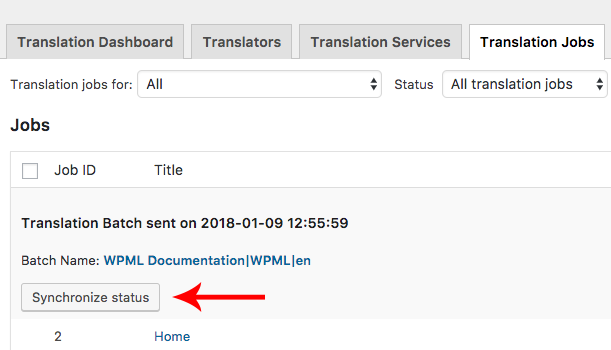 The “The site will fetch translations manually” means that completed translations can be downloaded from the Translations Dashboard (WPML->Translation Management), using the Check status and get translations button at the top of the page. You cannot cancel individual jobs; however, you can cancel a submission, including all the jobs in it, from the GlobalLink Project Director dashboard. Select the submission you want to cancel and click the “Edit Submission” icon. A dialog will open in which you can select “Cancel Submission“. Note: if you do not have access to the GlobalLink Project Director dashboard, please contact your Translations.com Account Manager. Depending on your workflow configuration you might not be able to cancel submissions that are already in progress. Please contact your Translations.com Account Manager for more information. When a submission is canceled, you can synchronize what appears under WPML’s Translation Jobs tab by clicking on the “Synchronize status” button. 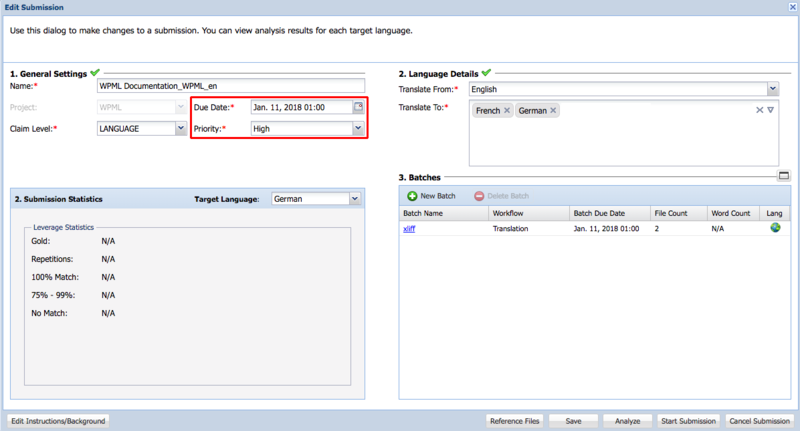 Depending on your Translation pickup mode configuration, this will happen automatically or after you have manually checked for completed translations using the “Check status and get translations” button from the Translation Dashboard tab. So if you have the “Translation Service will deliver translations automatically using XML-RPC” option selected, there is no need for you to do anything more at this point but wait for delivery. If you have “The site will fetch translations manually” selected then you will need to click on the “Check status and get translations” button.